Chandigarh, also known as ‘The City Beautiful’ is always brimming with happy people because of its lively aura. Designed by a French architect, it is one of the most-well-planned cities in India and boasts of numerous gardens, streets lined by trees on both sides, palatial houses, and luxurious cars. Chandigarh is also a tranquil place to live in and has the highest per capita income, making it one of the most affluent cities in the country. What would the local food scene be like in a city of such abundance and prosperity? The answer is a no-brainer. Delectable! Absolutely delectable! The city’s restaurants and eateries are always filled with people who love to spend their hard-earned money on the good things in life – food, food, and more food. People of Chandigarh know their food and know it well. From classy plush restaurants serving some of the best global cuisines to desi dhabas offering lip-smacking food, the city has it all! If you are in the city and wondering where and how to begin your culinary journey, read on. We have compiled a list of the best restaurants in Chandigarh, where you would love to eat, any day, all day. We often think vegetarians don’t have many options when it comes to dining. However, if you are in Chandigarh, even the vegetarian food seems loaded with heavenly taste, so much so that you can’t resist but gulp it all. Here are a few tasteful veg restaurants in Chandigarh. Known across India for their rich and flavorsome south Indian food, this chain of restaurants has made its mark successfully on the taste buds of the people in Chandigarh. When you want to binge on pure vegetarian meals that are of great quality, head to Sagar Ratna without any second thoughts. You can expect a peaceful ambiance, professional staff, and a family atmosphere at this place. The place also dishes out some of the best North Indian delicacies for you. Melt-in-the-mouth idlis and rotis, drool-worthy dosas and uthappams or aromatic malai kofta and dal makhani, you name it and Sagar Ratna has it all. The restaurant has several chains across the city, of which the one in Sector 17 is the most popular. 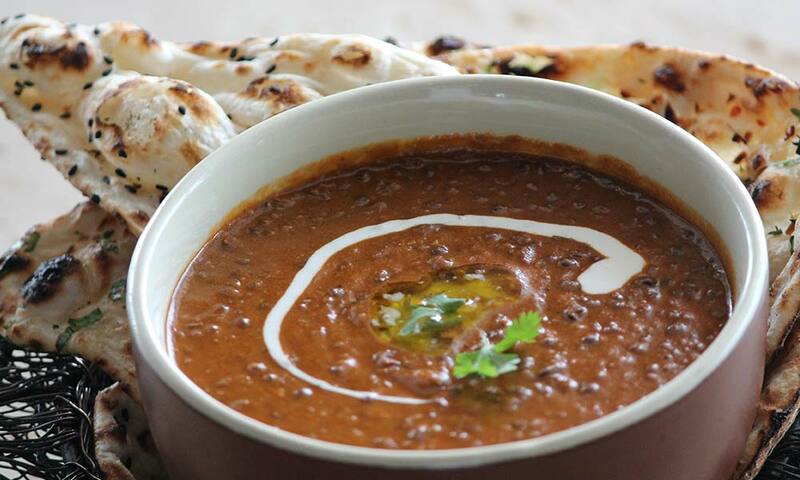 Are you in for a royal experience while enjoying your favorite dal makhni with naan? Dastarkhan is where you should be dining at! Housed inside Fort Ramgarh, this restaurant is one of the most thronged restaurants in Panchkula. Think of huge palace-like walls, dimly lit interiors, walls adorned with centuries-old swords along with an extensive multi-cuisine menu, including Chinese, North Indian, Continental and Rajasthani foods – that’s Dastarkhan for you. If you are in the mood to infuse some Western spirit into this Indian restaurant, you can also opt for their burgers and sandwiches which are equally yummy. One of the best restaurants in Chandigarh in the Mohali area, Laziz Rasoi promises a hearty vegetarian meal on any given day. You can enjoy your evenings here with live music and watching your favorite team play cricket on the big screen. The restaurant plates up some of the fine flavors of North Indian and Chinese cuisines for you, along with yummy fast food. Overall, it’s a relaxed and pleasant place to be at along with your family and friends. Looking for a filling and sumptuous buffet in Chandigarh? The city will never disappoint you because it is dotted with eateries that serve up an extensive and delicious spread, leaving every visitor satisfied and asking for more. 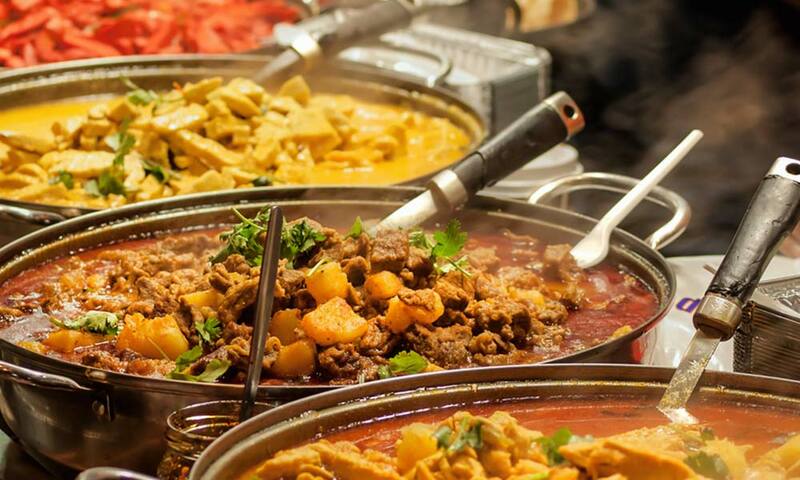 Here are a few amazing buffet restaurants in Chandigarh. Have your best experience of a barbecue buffet at Barbeque Nation, Chandigarh – a restaurant that boasts of quality, dishes, and ambiance. Spoilt for choice because of the unlimited buffet, people love to visit Barbecue Nation for their consistently good taste in both vegetarian and non-vegetarian cuisines. This place is also known for being the pioneers of the concept of live grills embedded on the dining tables. The live counters in the restaurant will also serve up some of the best flavors for you. Pirates of Grill is another favorite buffet destination for the people in Chandigarh, especially those who have a thing for grills. And guess what, this is a pirate-themed restaurant and hence the name. It’s a great place to visit on a cheat day to pamper yourself with an array of dishes, from starters to main course and desserts. Complimentary cocktails add a feather to the cap and go well with their lovely food! How about binging on a wide array of mouth-watering dishes from Mughlai, North Indian, and Chinese cuisines? Head to Buffet Hut, Chandigarh where you can enjoy a great buffet meal but stay light on your pocket. Keeping in mind the gastronomic interests of both vegetarians and non-vegetarians, Buffet Hut has curated a long spread that includes soups, kababs, kofta, pasta, noodles, biryani, pulao, rotis, and desserts, among others. They serve customers with a memorable dining experience with the best value for money. The Lalit is one of the best hotels in Chandigarh if you want to sit back and relax in a sophisticated ambiance. Housed inside this hotel is 24/7 All Day Dining, a restaurant that serves an extensive buffet menu with tasteful North Indian and Italian cuisines. You can also opt for their a la carte dining menu should you wish to spend a memorable evening with your special someone. Enjoy refreshing mocktails and cocktails here along with an electric atmosphere of music from live bands. When you are in the city of Punjabis, you should never miss the chance to enjoy some finger-licking non-vegetarian food at your favorite eateries. Here’s a list for all you non-veg lovers. Whistling Duck is a beautiful and spacious casual dining restaurant with big community tables. In this contemporary eatery, you can enjoy a wide variety of flavors from the global fare such as gnocchi, pork chops to desi malai tikkas and keema pao. Best suited for a relaxed Sunday brunch or a casual dinner during the weekdays, Whistling Duck is also awarded the best multi-cuisine restaurant by the Times Food Guide. You can also choose a glass of wine or cocktail to enhance your appetite as well as the dining experience. A culinary trip through Chandigarh is never deemed complete if you don’t visit a local dhaba where you can discover delicious dishes exploding with spices and flavors. Eclectic taste in every sense, Pal Dhaba is your humble desi restaurant with modest looks, but oh-so-yummy food! Go here when you want to take a break from your fancy restaurants yet enjoy a non-vegetarian meal that fills you to your heart’s content. You can spot everybody flocking to Pal Dhaba, the wealthy and the common man, to enjoy their mutton kebabs, butter chicken, and crispy naans. Don’t forget to have a glass of lassi at the end of your meal here, a rich Indian yogurt drink, which is quite famous with the regulars. Fancy a holiday in the Mediterranean region? Virgin Courtyard will give you a feel of the same with their pebbled pathways, sunlit courtyard and the amazing white and blue décor. Enjoy an Italian fare along with your loved one on a perfect date in this fine diner, which is touted as one of the top 10 restaurants in Chandigarh. What’s Italian cuisine without some great pizzas? You get to enjoy delectable pizzas here along with the very famous Tiramisu, not to mention other crowd pullers such as pasta, salads, cocktails, and risotto, and others. Tired of eating heavy gravies filled with oodles of cooking oil? Are you looking for a healthier option when it comes to your favorite chicken? 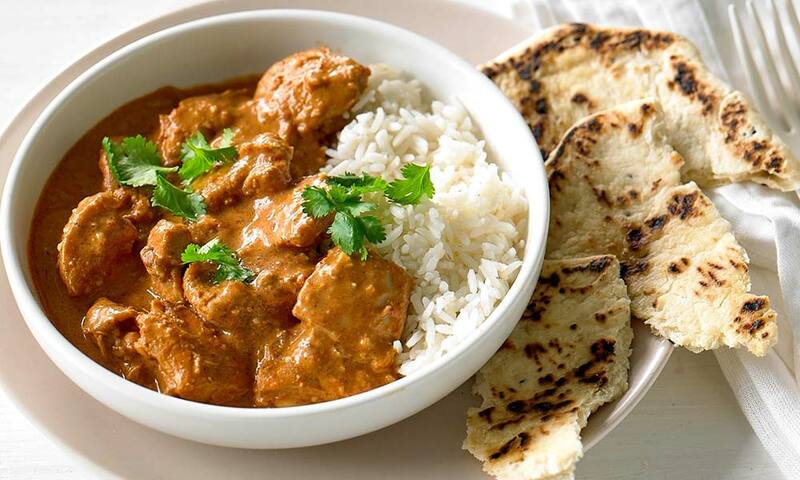 Go for O’ Chicken India as they have a variety of oil-free chicken recipes to choose from. They also specialize in late night deliveries within thirty minutes and are known for prompt service. Their USP is that they and follow a healthy, herbal, organic style of cooking, a recipe borrowed from the hills of Himachal, all the way to Chandigarh. O’ Chicken only delivers food as of now and does not have a sit-out restaurant. For those who have been living in this city, the name Swagath needs no introduction. It’s a seafood haven in the heart of Chandigarh, where you can find aromatic dishes and delicacies from Malabari, Mangalorean, Chettinadu, and Mughlai cuisines. From prawns koliwada and pomfret butter pepper garlic to Mangalorean tawa fried fish and Chinese style fish fingers, crabs, you will find fine flavors of seafood at this local favorite. The place is also known for other meaty delights, both chicken and mutton. The beverage menu at Swagath is also quite extensive and includes cocktails, shooters, mocktails, spirits, beer, wine, and non-alcoholic drinks. Want to try something really special and simply delicious? Try something from the Malabari or Mangalorean menu, say appam, Malabari paratha or neer dosa. One glance at the menu and you will understand that this is a non-veg foodie’s paradise on earth! Cafés exhibit a charm of their own. And when it comes to the cozy cafés in Chandigarh, you can bask in fun-filled evenings with a cup of coffee along with your friends and family at a number of places. 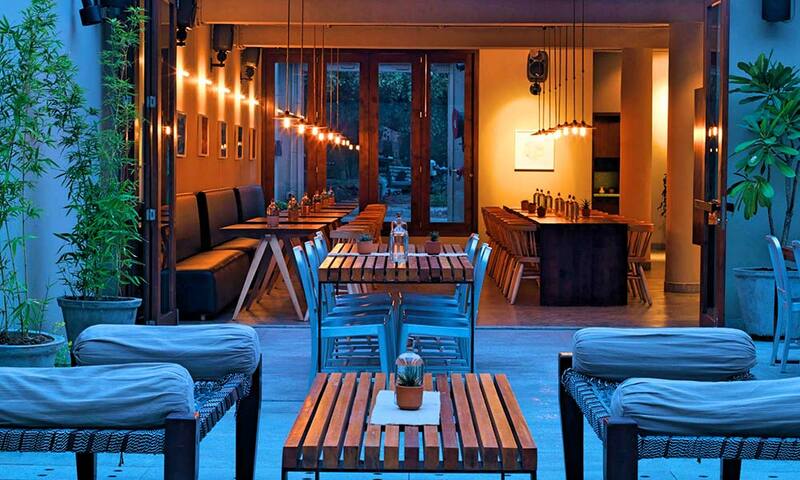 Here’s a list of some of the most loved cafes in Chandigarh. Backpacker’s Café is your answer to a good filling breakfast at the start of the day! The café mainly caters to travelers, as the name suggests, but is a popular choice with the locals as well as foreigners. You can enjoy this rustic café with its charming décor, walls filled with funky travel items such as books, guides, and toy vehicles. Get some travel inspiration by visiting this café and reading up different travel magazines while waiting for your scrumptious breakfast. From traditional breakfast options to custom-made choices, Backpacker’s Café has an all day long breakfast menu. The place also serves a fine range of burgers, sandwiches, pasta, salads, pizzas, desserts, and small eats. Their cinnamon and raisin pancakes dipped in maple syrup known as ‘Accelerator’, is a must try dish here. Equally popular are their fried mozzarella cheese bombs. Head to Garlic and Greens if you are in the spirit of trying out something innovative, right out of their kitchen! Flaunting a chic and elegant décor, this small café serves up some succulent vegetarian delights and tasty beverages. Starters, burgers, sandwiches, soups, pizzas, pasta, pies, desserts or mocktails, you name it and Garlic and Greens has it all. This is Chandigarh city’s very own Italian joint presenting European style cuisine. A vibrant café with superb décor and wall art, Café JC’s is one of the most happening eateries in Chandigarh. Known for its delicious food ranging from Indian and continental to American, Chinese, and Italian, the place is ideal for a late brunch or a casual dinner, any day of the week. The café has both outdoor and indoor sitting areas and they also serve breakfast that includes French toast, buttermilk pancakes, upma, bun omelet, and several other scrumptious items. Elegant interiors, retro music playing in the background and some amazing food, Café JC’s will make you come back for more every time you visit here. The Willow Café is a cozy little place serving amazing all-day breakfast options from western and Indian cuisines and has a variety of different types of coffees to choose from. Wooden tables and chairs and plush sofas breathe an old-school charm into the three-storeyed café. This place is the perfect blend of global food such as French toasts, omelets and desi recipes such as stuffed parathas with curd and pickle. A good place to visit to enjoy good food along with friendly staff and a quick service, The Willow Café is a popular choice among the city’s youngsters. There are certainly more places to add to this list, Chandigarh paints a promising picture for achieving food nirvana with its tantalizing aromas of rich Punjabi food and lovely gourmet fare. Indulge in the guilty pleasures of mouth-watering dishes served by some of the iconic restaurants in Chandigarh and feel complete bliss!